The first section of Chapter 3 goes through the history of Britain from its beginnings that can be traced back to the Stone Age, covering all the different civilisations that lived in Britain in the old times including the Romans, the Anglo-Saxons, the Vikings and the Normans. Section 2 examines the history of Britain during mediaeval times, including a review of the Black Death disease which affected a large part of the British population and which resulted in the appearance of new social classes. The Middle Ages (mediaeval times) also brought important legal and political changes, such as the development of Parliaments in England and Scotland. This period is also known for the development of the English language. The last part of this section focuses on the British Civil War that gave rise to the House of Tudor. Section 3 is an overview of the Tudor and the Stuart monarchs of Britain starting with the reign of Henry VIII at the beginning of the 16th century, followed by the reigns of his daughter Elizabeth I, James I of England and Charles I to the creation of the English republic by Oliver Cromwell, the restoration of the monarchy and up to the times of the Glorious Revolution in the late 17th century. 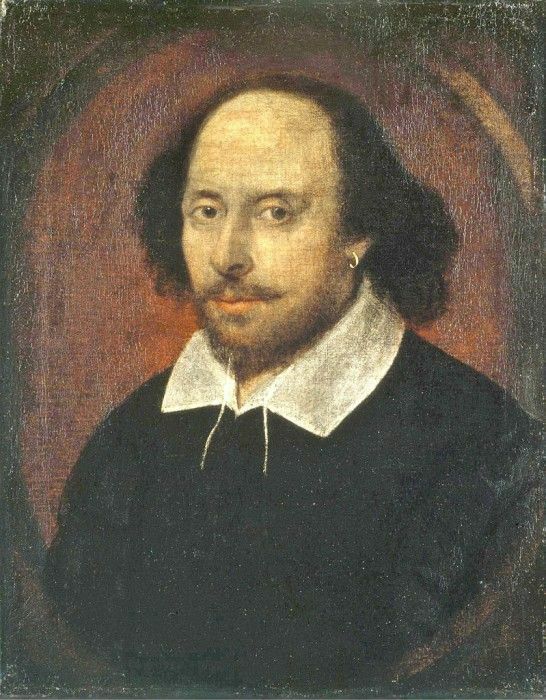 Furthermore, this section provides information about the Elizabethan period in England which is a remarkable period in British history and which includes achievements such as the defeat of the Spanish Armada, the beginning of the colonisation of new land and that is also known by the richness of the British poetry and drama to include playwrights such as William Shakespeare. Section 4 explores the creation of the constitutional monarchy, the creation of the Kingdom of Great Britain through the Act of the Union by which the Scotland adhered to England and Wales, the rebellion of the clans in Scotland, the period of the Enlightenment during the 18th century, the Industrial Revolution driven by the development of machinery and the use of steam power, the booming of the slave trade and its subsequent abolition through the Emancipation Act, the union of Northern Ireland with England, Wales and Scotland to form the United Kingdom of Great Britain and Ireland, the independence of a number of American colonies, the wars with France and the Crimean war, the growth of the British Empire and the development of the democracy. Section 5 covers the periods from the First World War to the Second World War and what the meant for Britain. Section 6 runs through the political, social and economic changes that took place in the Britain after the Second World War and up to recent times. It also introduces some of the most important British personalities and inventions of the 20th century. The first people to live in Britain were hunter-gatherers, in what we call the Stone Age. For much of the Stone Age, Britain was connected to the continent by a land bridge. People came and went, following the herds of deer and horses which they hunted. Britain only became permanently separated from the continent by the Channel about 10,000 years ago. The first farmers arrived in Britain 6,000 years ago. The ancestors of these first farmers probably came from south-east Europe. These people built houses, tombs and monuments on the land. One of these monuments, Stonehenge, still stands in what is now the English county of Wiltshire. Stonehenge was probably a special gathering place for seasonal ceremonies. Other Stone Age sites have also survived. Skara Brae on Orkney, off the north coast of Scotland, is the best preserved prehistoric village in northern Europe, and has helped archaeologists to understand more about how people lived near the end of the Stone Age. Around 4,000 years ago, people learned to make bronze. We call this period the Bronze Age. People lived in roundhouses and buried their dead in tombs called round barrows. The people of the Bronze Age were accomplished metalworkers who made many beautiful objects in bronze and gold, including tools, ornaments and weapons. The Bronze Age was followed by the Iron Age, when people learned how to make weapons and tools out of iron. People still lived in roundhouses grouped together into larger settlements, and sometimes defended sites called hill forts. A very impressive hill fort can still be seen today at Maiden Castle, in the English county of Dorset. Most people were farmers, craft workers or warriors. The language they spoke was part of the Celtic language family. Similar languages were spoken across Europe in the Iron Age and related languages are still spoken today in some parts of Wales, Scotland and Ireland. The people of the Iron Age had a sophisticated culture and economy. They made the first coins to be minted in Britain, some inscribed with the names of Iron Age kings. 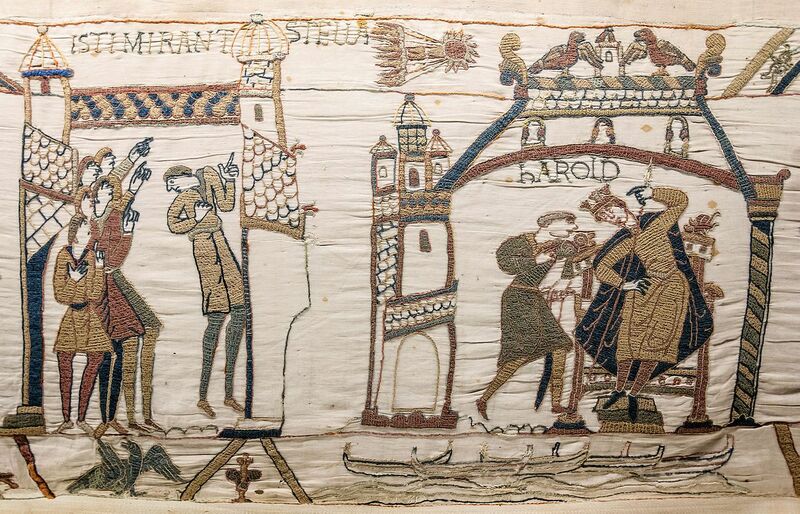 This marks the beginnings of British history. Julius Caesar led a Roman invasion of Britain in 55 BC. This was unsuccessful and for nearly 100 years Britain remained separate from the Roman Empire. In AD 43 the Emperor Claudius led the Roman army in a new invasion. This time, there was resistance from some of the British tribes but the Romans were successful in occupying almost all of Britain. One of the tribal leaders who fought against the Romans was Boudicca, the queen of the Iceni in what is now eastern England. She is still remembered today and there is a statue of her on Westminster Bridge in London, near the Houses of Parliament. Areas of what is now Scotland were never conquered by the Romans, and the Emperor Hadrian built a wall in the north of England to keep out the Picts (ancestors of the Scottish people). Included in the wall were a number of forts. Parts of Hadrian’s Wall, including the forts of Housesteads and Vindolanda, can still be seen. It is a popular area for walkers and is a UNESCO (United Nations Educational Scientific and Cultural Organization) World Heritage Site. The Romans remained in Britain for 400 years. They built roads and public buildings, created a structure of law, and introduced new plants and animals. It was during the 3rd and 4th centuries AD that the first Christian communities began to appear in Britain. The Roman army left Britain in AD 410 to defend other parts of the Roman Empire and never returned. Britain was again invaded by tribes from northern Europe: the Jutes, the Angles and the Saxons. The languages they spoke are the basis of modern-day English. Battles were fought against these invaders but, by about AD 600, Anglo-Saxon kingdoms were established in Britain. These kingdoms were mainly in what is now England. The burial place of one of the kings was at Sutton Hoo in modern Suffolk. This king was buried with treasure and armour, all placed in a ship which was then covered by a mound of earth. Parts of the west of Britain, including much of what is now Wales, and Scotland, remained free of Anglo-Saxon rule. The Anglo-Saxons were not Christians when they first came to Britain but, during this period, missionaries came to Britain to preach about Christianity. Missionaries from Ireland spread the religion in the north. The most famous of these were St Patrick, who would become the patron saint of Ireland, and St Columba, who founded a monastery on the island of Iona, off the coast of what is now Scotland. St Augustine led missionaries from Rome, who spread Christianity in the south. St Augustine became the first Archbishop of Canterbury. The Vikings came from Denmark and Norway. They first visited Britain in AD 789 to raid coastal towns and take away goods and slaves. Then, they began to stay and form their own communities in the east of England and Scotland. The Anglo-Saxon kingdoms in England united under King Alfred the Great, who defeated the Vikings. Many of the Viking invaders stayed in Britain – especially in the east and north of England in an area known as the Danelaw (many place names there, such as Grimsby and Scunthorpe come from the Viking languages). The Viking settlers mixed with local communities and some converted to Christianity. Anglo-Saxon kings continued to rule what is now England, except for a short period when there were Danish kings. The first of these was Cnut, also named Canute. In the north, the threat of attack by Vikings had encouraged the people to unite under one king, Kenneth MacAlpin. The term Scotland began to be used to describe that country. In 1066, an invasion led by William, the Duke of Normandy (in what is now northern France), defeated Harold, the Saxon king of England, at the Battle of Hastings. Harold was killed in the battle. William became king of England and is known as William the Conqueror. The battle is commemorated in a great piece of embroidery, known as the Bayeux tapestry, which can still be seen in France today. The Norman Conquest was the last successful foreign invasion of England and led to many changes in government and social structures in England. Norman French, the language of the new ruling class influenced the development of the English language as we know it today. Initially the Normans also conquered Wales, but the Welsh gradually won territory back. The Scots and the Normans fought on the border between England and Scotland; the Normans took over some land on the border but did not invade Scotland. William sent people all over England to draw up lists of all the towns and villages. The people who lived there, who owned the land and what animals they owned were also listed. This was called the Domesday Book. It still exists today and gives a picture of society in England just after the Norman Conquest. The period after the Norman Conquest up until about 1485 is called the Middle Ages (or the medieval period). It was a time of almost constant war. The English kings fought with the Welsh, Scottish and Irish noblemen for control of their lands. In Wales, the English were able to establish their rule. In 1284 King Edward I of England introduced the Statute of Rhuddlan, which annexed Wales to the Crown of England. Huge castles, including Conwy and Caenarvon, were built to maintain this power. By the middle of the 15th century the last Welsh rebellions had been defeated. English laws and the English language were introduced. There were few formal limits to the king’s power until 1215. In that year, King John was forced by his noblemen to agree to a number of demands. The result was a charter of rights called the Magna Carta (which means the Great Charter). The Magna Carta established the idea that even the king was subject to the law. It protected the rights of the nobility and restricted the king’s power to collect taxes or to make and change laws. In future, the king would need to involve his noblemen in decisions. In England, parliaments were called for the king to consult his nobles, particularly when the king needed to raise money. The numbers attending Parliament increased and two separate parts, known as Houses were established. This nobility, great landowners and bishops sat in the House of Lords. Knights, who were usually smaller landowners, and wealthy people from towns and cities were elected to sit in the House of Commons. Only a small part of the population was able to join in electing the members of the Commons. This was also a time of development in the legal system. The principle that judges are independent of the government began to be established. In England, judges developed ‘common law’ by a process of precedence (that is, following previous decisions) and tradition. In Scotland, the legal system developed slightly differently and laws were ‘codified’ (that is, written down). The Middle Ages saw the development of a national culture and identity. After the Norman Conquest, the king and his noblemen had spoken Norman French and the peasants had continued to speak Anglo-Saxon. Gradually these two languages combined to become one English language. Some words in modern English – for example, ‘park’ and ‘beauty’ – are based on Norman French words. Other – for example, ‘apple’, ‘cow’ and ‘summer’ – are based on Anglo-Saxon words. In modern English there are often two words with very similar meanings, one from French and one from Anglo-Saxon. ‘Demand’ (French) and ‘ask’ (Anglo-Saxon) are examples. By 1400, in England, official documents were being written in English, and English had become the preferred language of the royal court and Parliament. In the years leading up to 1400, Geoffrey Chaucer wrote a series of poems in English about a group of people going to Canterbury on a pilgrimage. The people decided to tell each other stories on the journey, and the poems describe the travellers and some of the stories they told. This collection of poems is called The Canterbury Tales. It was one of the first books to be printed by William Caxton, the first person in England to print books using a printing press. Many of the stories are still popular. Some have been made into plays and television programmes. The Middle Ages also saw a change in the type of buildings in Britain. Castles were built in many places in Britain and Ireland, partly for defence. Today many are in ruins, although some, such as Windsor and Edinburgh, are still in use. Great cathedrals – for example, Lincoln Cathedral – were also built, and many of these are still used for worship. Several of the cathedrals had windows of stained glass, telling stories about the Bible and Christian saints. 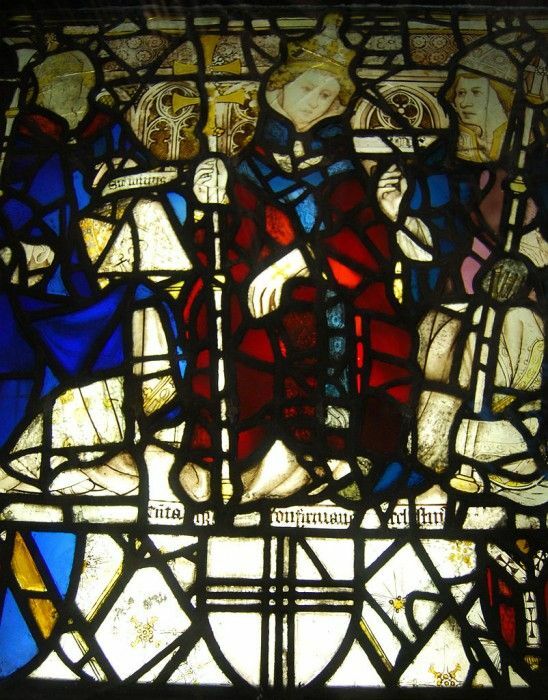 The glass in York Minster is a famous example. In 1455, a civil war was begun to decide who should be king of England. It was fought between the supporters of two families: the House of Lancaster and the House of York. This war was called the Wars of the Roses, because the symbol of Lancaster was a red rose and the symbol of York was a white rose. The wars ended with the Battle of Bosworth Field in 1485. King Richard III of the House of York was killed in the battle and Henry Tudor, the leader of the House of Lancaster, became King Henry VII. Henry then married King Richard’s niece, Elizabeth of York, and united the two families. 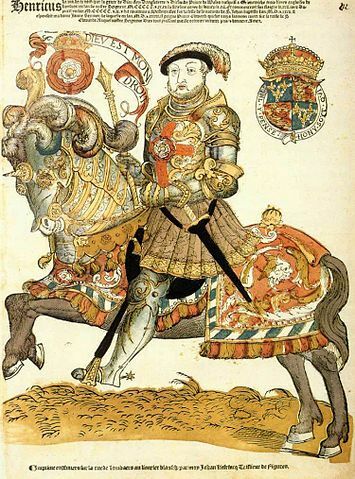 Henry was the first king of the House of Tudor. The symbol of the House of Tudor was a red rose with a white rose inside it as a sign that the Houses of York and Lancaster were now allies. Catherine of Aragon – Catherine was a Spanish princess. She and Henry had a number of children but only one, Mary, survived. When Catherine was too old to give him another child, Henry decided to divorce her, hoping that another wife would give him a son to be his heir. Anne Boleyn – Anne Boleyn was English. She and Henry had one daughter, Elizabeth. Anne was unpopular in the country and was accused of taking lovers. She was executed at the tower of London. Jane Seymour – Henry married Jane after Anne’s execution. She gave Henry the son he wanted, Edward, but she died shortly after his birth. Anne of Cleves – Anne was a German princess. Henry married her for political reasons but divorced her soon after. Catherine Howard – Catherine was a cousin of Anne Boleyn. She was also accused of taking lovers and executed. Catherine Parr – Catherine was a widow who married Henry later in his life. She survived him and married again but died soon after. At the same time the Reformation was happening across Europe. This was a movement against the authority of the Pope and the ideas and practices of the Roman Catholic Church. The Protestants formed their own churches. They read the Bible in their own languages instead of Latin; they did not pray to saints or at shrines; and they believed that a person’s own relationship with God was more important than submitting to the authority of the Church. Protestant ideas gradually gained strength in England, Wales and Scotland during the 16th century. Elizabeth I was the younger daughter of Henry VIII. Queen Elizabeth I was a Protestant. She re-established the Church of England as the official Church of England. Everyone had to attend their local church and there were laws about the type of religious services and the prayers which could be said, but Elizabeth did not ask about people’s real beliefs. She succeeded in finding a balance between the views of the Catholics and the more extreme Protestants. In this way, she avoided any serious religious conflict within England. Elizabeth became one of the most popular monarchs in English history, particularly after 1588, when the English defeated the Spanish Armada (a large fleet of ships), which had been sent by Spain to conquer England and restore Catholicism. The queen of Scotland, Mary Stuart (often now called ‘Mary, Queen of Scots’) was a Catholic. She was only a week old when her father died and she became queen. Much of her childhood was spent in France. When she returned to Scotland, she was the centre of a power struggle between different groups. When her husband was murdered, Mary was suspected of involvement and fled to England. She gave her throne to her Protestant son, James VI of Scotland. Mary was Elizabeth I’s cousin and hoped that Elizabeth might help her, but Elizabeth suspected Mary of wanting to take over the English throne, and kept her prisoner for 20 years. Mary was eventually executed, accused of plotting against Elizabeth I. The Elizabethan period in England was a time of growing patriotism: a feeling of pride in being English, English explorers sought new trade routes and tried to expand British trade into the Spanish colonies in the Americas. Sir Francis Drake, one of the commanders in the defeat of the Spanish Armada, was one of the founders of England’s naval tradition. His ship, the Golden Hind, was one of the first to sail right around (‘circumnavigate’) the world. In Elizabeth I’s time, English settlers first began to colonise the eastern coast of America. This colonisation, particularly by people who disagreed with the religious views of the next two kings, greatly increased in the next century. During this period, Ireland was an almost completely Catholic country. Henry VII and Henry VIII had extended English control outside the Pale and had established English authority over the whole country. Henry VIII took the title ‘King of Ireland’. English laws were introduced and local leaders were expected to follow the instructions of the Lord Lieutenants in Dublin. During the reigns of Elizabeth I and James I, many people in Ireland opposed rule by the Protestant government in England. There were a number of rebellions. The English government encouraged Scottish and English Protestants to settle in Ulster, the northern province of Ireland, taking over the land from Catholic landholders. These settlements were known as plantations. Many of the new settlers came from south-west Scotland and other land was given to companies based in London. James later organised similar plantations in several other parts of Ireland. This had serious longterm consequence for the history of England, Scotland and Ireland. James I and his son Charles I were less skilled politically. Both believed in the ‘Divine Right of Kings’: the idea that the king was directly appointed by God to rule. They thought that the king should be able to act without having to seek approval from Parliament. When Charles I inherited the thrones of England, Wales, Ireland and Scotland, he tried to rule in line with this principle. When he could not get Parliament to agree with his religious and foreign policies, he tried to rule without the Parliament at all. For 11 years, he found ways in which to raise money without Parliament’s approval but eventually trouble in Scotland meant that he had to recall Parliament. Charles I wanted the worship of the Church of England to include more ceremony and introduced a revised Prayer Book. He tried to impose this Prayer Book on the Presbyterian Church in Scotland and this led to serious unrest. A Scottish army was formed and Charles could not find the money he needed for his own army without the help of Parliament. In 1640, he recalled Parliament to ask it for funds. Many in Parliament were Puritans, a group of Protestants who advocated strict and simple religious doctrine and worship. They did not agree with the king’s religious views and disliked his reforms of the Church of England. Parliament refused to give the king the money he asked for, even after the Scottish army invaded England. Another rebellion began in Ireland because the Roman Catholics in Ireland were afraid of the growing power of the Puritans. Parliament took this opportunity to demand control of the English army – a change that would have transferred substantial power from the king to Parliament. In response, Charles I entered the House of Commons and tried to arrest five parliamentary leaders, but they had been warned and were not there. (No monarch has set foot in the Commons since.) Civil war between the king and Parliament could not now be avoided and began in 1642. The country split into those who supported the king (the Cavaliers) and those who supported Parliament (the Roundheads). The king’s army was defeated at the Battles of Marston Moor and Naseby. By 1646, it was clear that the Parliament had won the war. Charles was held prisoner by the parliamentary army. He was still unwilling to reach any agreement with the Parliament and in 1649 he was executed. The Scots had not agreed to the execution of Charles I and declared his sonCharles II to be king. He was crowned king of Scotland and led a Scottish army into England. Cromwell defeated this army in the Battles of Dunbar and Worcester. Charles II escaped from Worcester, famously hiding in an oak tree on one occasion, and eventually fled to Europe. Parliament now controlled Scotland as well as England and Wales. After his campaign in Ireland and victory over Charles II at Worcester, Cromwell was recognised as the leader of the new republic. He was given the title of Lord Protector and ruled until his death in 1658. When Cromwell died, his son, Richard, became Lord Protector in his place but was not able to control the army or the government. Although Britain had been a republic for 11 years, without Oliver Cromwell there was no clear leader or system of government. Many people in the country wanted stability. People began to talk about the need for a king. In May 1660, Parliament invited Charles II to come back from exile in The Netherlands. He was crowned King Charles II of England, Wales, Scotland and Ireland. Charles II made it clear that he had ‘no wish to go on his travels again’. He understood that he could not always do as he wished but would sometimes need to reach agreement with the Parliament. Generally, Parliament supported his policies. The Church of England again became the established official Church. Both Roman Catholics and Puritans were kept out of power. Charles II was interested in science. During his reign, the Royal Society was formed to promote ‘natural knowledge’. This is the oldest surviving scientific society in the world. Among its early members were Sir Edmund Halley who successfully predicted the return of the comet now called Halley’s Comet, and Sir Isaac Newton. Born in Lincolnshire, eastern England, Isaac Newton first became interested in science when he studied at Cambridge University. He became an important figure in the field. His most famous published work was Philosophiae Naturalis Principia Mathematica (‘Mathematical Principle of Natural Philosophy’), which showed how gravity applied to the whole universe. Newton also discovered that white light is made up of the colours of the rainbow. Many of his discoveries are still important for modern science. Charles II had no legitimate children. He died in 1685 and his brother, James, who was a Roman Catholic, became King James II in England, Wales and Ireland and King James VII of Scotland. James favoured Roman Catholics and allowed them to be army officers, which an Act of Parliament had forbidden. He did not seek to reach agreements with Parliament and arrested some of the bishops of the Church of England. People in England worried that James wanted to make England a Catholic country once more. However, his heirs were his two daughters, who were both firmly Protestant, and people thought that this meant there would soon be a Protestant monarch again. Then James’s wife had a son. Suddenly, it seemed likely that the next monarch would not be a Protestant after all. James II’s elder daughter, Mary, was married to her cousin William of Orange, the Protestant ruler of the Netherlands. In 1688, important Protestants in England asked William to invade England and proclaim himself king. When William reached England, there was no resistance. James fled to France and William took over the throne, becoming William III in England, Wales and Ireland, and William II of Scotland. William ruled jointly with Mary. This event was later called the ‘Glorious Revolution’ because there was no fighting in England and because it guaranteed the power of Parliament, ending the threat of monarch ruling on his or her own as he or she wished. James II wanted to regain the throne and invaded Ireland with the help of a French army. William defeated James II at the Battle of the Boyne in Ireland in 1690, an event which is still celebrated by some in Northern Ireland today. William re-conquered Ireland and James fled back to France. Many restrictions were placed on the Roman Catholic Church in Ireland and Irish Catholics were unable to take part in the government. There was also support for James in Scotland. An attempt at an armed rebellion in support of James was quickly defeated at Killiecrankie. All Scottish clans were required formally to accept William as king by taking an oath. The MacDonalds of Glencoe were late in taking an oath. The memory of this massacre meant some Scots distrusted the new government. Some continued to believe that James was the rightful king, particularly in Scotland. Some joined him in exile in France; others were secret supporters. James’ supporters became known as Jacobites. At the coronation of William and Mary, a Declaration of Rights was read. This confirmed that the king would no longer be able to raise taxes and administer justice without agreement from Parliament. The balance of power between monarch and Parliament had now permanently changed. The Bill of Rights, 1689, confirmed the rights of Parliament and the limits of the king’s power. Parliament took control of who could be monarch and declared that the king or queen must be a Protestant. A new Parliament had to be elected at least every three years (later this became seven years and now it is five years). Every year the monarch had to ask Parliament to renew funding for the army and the navy. The laws passed after the Glorious Revolution are the beginning of what is called ‘constitutional monarchy’. The monarch remained very important but was no longer able to insist on particular policies or actions if Parliament did not agree. After William III, the ministers gradually became more important than the monarch but this was not a democracy in the modern sense. The number of people who had the right to vote for members of Parliament was still very small. Only men who owned property of a certain value were able to vote. No women at all had the vote. Some constituencies were controlled by a single wealthy family. They were called the ‘pocket boroughs’. Other constituencies had hardly any voters and were called ‘rotten boroughs’. William and Mary’s successor, Queen Anne, had no surviving children. This created uncertainty over the succession in England, Wales and Ireland and in Scotland. The Act of Union, known as the Treaty of Union in Scotland, was therefore agreed in 1707, creating the Kingdom of Great Britain. Although Scotland was no longer an independent country, it kept its own legal and education systems and Presbyterian Church. When Queen Anne died in 1714, Parliament chose a German, George I, to be the next king, because he was Anne’s nearest Protestant relative. An attempt by Scottish Jacobites to put James II’s son on the throne instead was quickly defeated. George I did not speak very good English and this increased his need to rely on his ministers. The most important minister in Parliament became known as the Prime Minister. The first man to be called this was Sir Robert Walpole, who was Prime Minister from 1721 to 1742. In 1745 there was another attempt to put a Stuart king back on the throne in place of George I’s son, George II. Charles Edward Stuart (Bonnie Prince Charlie), the grandson of James II, landed in Scotland. He was supported by clansmen from the Scottish highlands and raised and army. Charles initially had some successes but was defeated by George II’s army at the Battle of Culloden in 1746. Charles escaped back to Europe. Known in Scotland as ‘The Bard’, Robert Burns was a Scottish poet. He wrote in the Scots language, English with some Scottish words and standard English. He also revised a lot of the traditional folk songs by changing or adding lyrics. Burns’ best-known work is probably the song Auld Lang Syne, which is sung by people in the UK and other countries when they are celebrating the New Year (or Hogmanay as it is called in Scotland). Born in 1732, Arkwright originally trained and worked as a barber. He was able to dye hair and make wigs. When wigs became less popular, he started to work in textiles. He improved the original carding machine. Carding is the process of preparing fibres for spinning into yarn and fabric. He also developed horse-driven spinning mills that used only one machine. This increased the efficiency of production. Later, he used the steam engine to power machinery. Arkwright is particularly remembered for the efficient and profitable way that he ran his factories. Mahomet was born is 1759 and grew up in the Bengal region of India. He served in the Bengal army and came to Britain in 1782. He then moved to Ireland and eloped with an Irish girl called Jane Daly in 1786, returning to England at the turn of the century. In 1810 he opened the Hindoostane Coffee House in George Street, London. It was the first curry house to open in Britain. Mahomet and his wife also introduced ‘shampooing’, the Indian art of head massage, to Britain. There were, however people in Britain who opposed the slave trade. The first formal anti-slavery groups were set up by the Quakers in the late 1700s, and they petitioned Parliament to ban the practice. William Wilberforce, an evangelical Christian and a member of Parliament, also played an important part in changing the law. Along with other abolitionists (people who supported the abolition of slavery), he succeeded in turning public opinion against the slave trade. In 1807, it became illegal to trade slaves in British ships or from British ports, and in 1833 the Emancipation Act abolished slavery throughout the British Empire. The Royal Navy stopped slave ships from other countries, freed the slaves and punished the slave traders. After 1833, 2 million Indian and Chinese workers were employed to replace the freed slaves. They worked on sugar plantations in the Caribbean, in mines in South Africa, on railways in East Africa and in the army in Kenya. Spanish fleets, winning the Battle of Trafalgar in 1805. Admiral Nelson was in charge of the British fleet at Trafalgar and was killed in the battle. Nelson’s Column in Trafalgar Square, London, is a monument to him. His ship, HMS Victory, can be visited in Portsmouth. The British army also fought against the French. In 1815, the French Wars ended with the defeat of the Emperor Napoleon by the Duke of Wellington at the Battle of Waterloo. Wellington was known as the Iron Duke and later became Prime Minister. The Battle of Trafalgar (21 October 1805) was a naval engagement fought by the British Royal Navy against the combined fleets of the French Navy and Spanish Navy. Although Ireland had had the same monarch as England and Wales since Henry VIII, it had remained a separate country. In 1801, Ireland became unified with England, Scotland and Wales after the Act of Union of 1800. This created the United Kingdom of Great Britain and Ireland. One symbol of this union between England, Scotland, Wales and Ireland was a new version of the official flag, the Union Flag. This is still used today as the official flag of the UK. • The cross of St George, patron saint of England, is a red cross on a white ground. • The cross of St Andrew, patron saint of Scotland, is a diagonal white cross on a blue ground. • The cross of St Patrick, patron saint of Ireland, is a diagonal red cross on a white ground. The Union Flag is also known as the Union Jack. The crosses of the three countries combined form the Union Flag. Britain continued to be a great trading nation. The government began to promote policies of free trade, abolishing a number of taxes on imported goods. One example of this was the repealing of the Corn Laws in 1846. These had prevented the import of cheap grain. 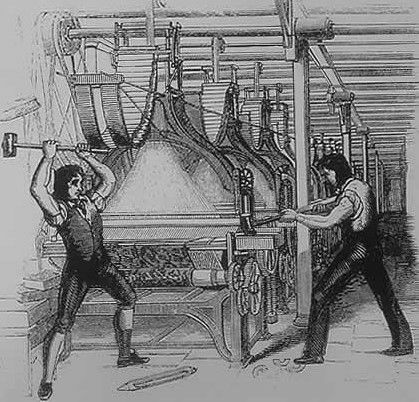 The reforms helped the development of the British industry, because raw materials could now be imported cheaply. Brunel was originally from Portsmouth, England. He was an engineer who built tunnels, bridges, railway lines and ships. He was responsible for constructing the Great Western Railway, which was the first major railway built in Britain. It runs from Paddington Station in London to the south west of England, the West Midlands and Wales. Many of Brunel’s bridges are still in use today. The Clifton Suspension Bridge was designed by Isambard Kingdom Brunel and is spanning the Avon Gorge. British industry led the world in the 19th century. The UK produced more that half of the world’s iron, coal and cotton cloth. The UK also became a centre for financial services, including insurance and banking. In 1851, the Great Exhibition opened in Hyde Park in the Crystal Palace, a huge building made of steel and glass. Exhibits ranged from huge machines to handmade goods. Countries from all over the world showed their goods but most of the objects were made in Britain. Conditions in Ireland were not as good as in the rest of the UK. Two-thirds of the population still depended on farming to make their living, often on very small plots of land. In the middle of the century the potato crop failed, and Ireland suffered a famine. A million people died from disease and starvation. Another million and a half left Ireland. Some emigrated to the United States and others came to England. By 1861 there were large populations of Irish people in cities such as Liverpool, London, Manchester and Glasgow. As the middle classes in the wealthy industrial towns and cities grew in influence, they began to demand more political power. The Reform Act of 1832 had greatly increased the number of people with the right to vote. The act also abolished the old pocket and rotten boroughs and more parliamentary seats were given to the towns and cities. There was a permanent shift of political power from the countryside to the towns but voting was still based on ownership of the property. This meant that members of the working class were still unable to vote. Politicians realised that the increased number of voters meant that they needed to persuade people to vote for them if they were to be sure of being elected to Parliament. The political parties began to create organizations to reach out to ordinary voters. Universal suffrage (the right of every adult, male or female, to vote) followed in the next century. In common with the rest of Europe, women in 19th century Britain had fewer rights than men. Until 1870, when a woman got married, her earnings, property and money automatically belonged to her husband. Acts of Parliament in 1870 and 1882 gave wives the right to keep their own earnings and property. In the late 19th and early 20th centuries, an increasing number of women campaigned and demonstrated for greater rights and, in particular, the right to vote. They formed the women’s suffrage movement and became known as the ‘suffragettes’. Although the British Empire continued to grow until the 1920s, there was already discussion in the late 19th century about its future direction. Supporters of expansion believed that the Empire benefited Britain through increased trade and commerce. Others thought the Empire had become over-expanded and that the frequent conflicts in many parts of the Empire, such as India’s north-west frontier or southern Africa, were a drain on resources. Yet the great majority of British people believed in the Empire as a force for good in the world. The early 20th century was a time of optimism in Britain. The nation, with its expansive Empire, well-admired navy, thriving industry and strong political institutions, was what is now known as a global ‘superpower’. It was also a time of social progress. Financial help for the unemployed, old-age pensions and free school meals were just a few of the important measures introduced. Various laws were passed to improve safety in the workplace; town planning rules were tightened to prevent the further development of slums; and better support was given to mothers and their children after divorce or separation. Local government became more democratic and a salary for members of Parliament (MPs) was introduced for the first time, making it easier for more people to take part in public life. This era of optimism and progress was cut short when war broke out between several European nations. On 28 June 1914, Archduke Franz Ferdinand of Austria was assassinated. This set off a chain of events leading to the First World War (1914-18). But while the assassination provided the trigger for war, other factors – such as a growing sense of nationalism in many European states; increasing militarism; imperialism; and the division of the major European powers into two camps – all set the conditions for war. The conflict was centred in Europe, but it was a global war involving nations from around the world. Britain was part of the Allied Powers, which included (amongst others) France, Russia, Japan, Belgium, Serbia – and later, Greece, Italy, Romania and the United States. The whole of the British Empire was involved in the conflict – for example, more than a million Indians fought on behalf of Britain in lots of different countries, and around 40,000 were killed. Men from the West Indies, Africa, Australia, New Zealand and Canada also fought with the British. The Allies fought against the Central Powers – mainly Germany, the Austro-Hungarian Empire, the Ottoman Empire and later Bulgaria. Millions of people were killed or wounded, with more than 2 million British casualties. One battle, the British attack of the Somme in July 1916, resulted in about 60,000 British casualties on the first day alone. The First World War ended at 11.00 am on 11th November 1918 with victory for Britain and its allies. In 1913, the British government promised ‘Home Rule’ for Ireland. The proposal was to have a self-governing Ireland with its own parliament but still part of the UK. A Home Rule Bill was introduced in Parliament. It was opposed by the Protestants in the north of Ireland, who threatened to resist Home Rule by force. The outbreak of the First World War led the British government to postpone any changes in Ireland. Irish Nationalists were not willing to wait and in 1916 there was an uprising (the Easter Rising) against the British in Dublin. The leaders of the uprising were executed under military law. A guerrilla war against the British army and the police in Ireland followed. In 1921 a peace treaty was signed and in 1922 Ireland became two countries. The six countries in the north which were mainly Protestant remained part of the UK under the name Northern Ireland. The rest of Ireland became the Irish Free State. It had its own government and became a republic in 1949. There were people in both parts of Ireland who disagree with the split between the North and the South. They still wanted Ireland to be one independent country. Years of disagreement led to a terror campaign in Northern Ireland and elsewhere. The conflict between those wishing for full Irish independence and those wishing to remain loyal to the British government is often referred to as ‘the Troubles’. In the 1920s, many people’s living conditions got better. There were improvements in public housing and new homes were built in many towns and cities. However, in 1929, the world entered the ‘Great Depression’ and some parts of the UK suffered mass unemployment. The effects of the depression of the 1930s were felt differently in different parts of the UK. The traditional heavy industries such as shipbuilding were badly affected but new industries – including the automobile and aviation industries – developed. As prices generally fell, those in work had more money to spend. Car ownership doubled from 1 million to 2 million between 1930 and 1939. In addition, many new houses were built. It was also a time of cultural blossoming, with writers such as Graham Greene and Evelyn Waugh prominent. The economist John Maynard Keynes published influential new theories of economics. The BBC started radio broadcasts in 1922 and began the world’s first regular television service in 1936. Adolf Hitler came to power in Germany in 1933. He believed that the conditions imposed on Germany by the Allies after the First World War were unfair; he also wanted to conquer more land for the German people. He set about renegotiating treaties, building up arms, and testing Germany’s military strength in nearby countries. The British government tried to avoid another war. However, when Hitler invaded Poland in 1939, Britain and France declared war in order to stop his aggression. The war was initially fought between the Axis powers (fascist Germany and Italy and the Empire of Japan) and the Allies. The main countries on the allied side were the UK, France, Poland, Austria, New Zealand, Canada, and the Union of South Africa. Having occupied Austria and invaded Czechoslovakia, Hitler followed his invasion of Poland by taking control of Belgium and the Netherlands. Then, in 1940, German forces defeated allied troops and advanced through France. At this time of national crisis, Winston Churchill became Prime Minister and Britain’s war leader. 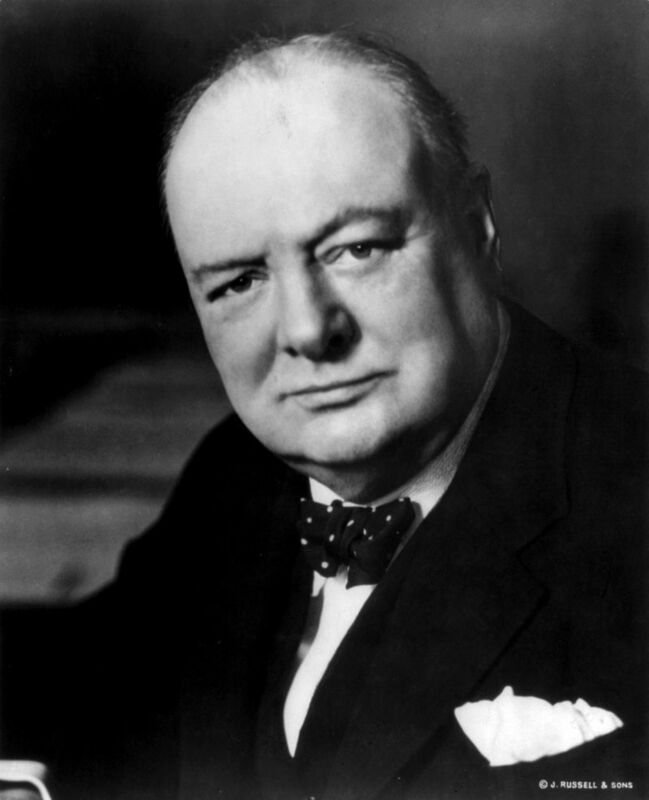 Churchill was the son of a politician and, before becoming a Conservative MP in 1900, was a soldier and journalist. In May 1940 he became Prime Minister. He refused to surrender to the Nazis and was an inspirational leader to the British people in a time of hardship. He lost the General Election in 1945 but returned as Prime Minister in 1951. As France fell, the British decided to evacuate British and French soldiers from France in a huge naval operation. Many civilian volunteers in small pleasure and fishing boats from Britain helped the Navy to rescue more than 300,000 men from the beaches around Dunkirk. Although many lives and a lot o equipment were lost, the evacuation was a success and meant that Britain was better able to continue the fight against the Germans. The evacuation gave rise to the phrase ‘the Dunkirk spirit’. From the end of June 1940 until the German invasion of the Soviet Union in June 1941, Britain and the Empire stood almost alone against Nazi Germany. Hitler wanted to invade Britain, but before sending in troops, Germany needed to control the air campaign against Britain, but the British resisted with their fighter planes and eventually won the crucial aerial battle against the Germans, called ‘the Battle of Britain’, in the summer of 1940. The most important planes used by the Royal Air Force in the Battle of Britain were the Spitfire and the Hurricane – which were designed and built in Britain. Despite this crucial victory, the German air force was able to continue bombing London and other British cities at night-time. This was called the Blitz. Coventry was almost totally destroyed and a great deal of damage was done in other cities, especially in the East End of London. Despite the destruction, there was a strong national spirit of resistance in the UK. The phrase ‘the Blitz spirit’ is still used today to describe Britons pulling together in the face of adversity. At the same time as defending Britain, the British military was fighting the Axis on many other fronts. In Singapore, the Japanese defeated the British and then occupied Burma, threatening India. The United States entered the war when the Japanese bombed its naval base at Pearl Harbor in December 1941. That same year, Hitler attempted the largest invasion in history by attacking the Soviet Union. It was a fierce conflict, with huge losses on both sides. German forces were ultimately repelled by the Soviets, and the damage they sustained proved to be a pivotal point in the war. The allied forces gradually gained the upper hand, winning significant victories in North Africa and Italy. German losses in the Soviet Union, combined with the support of the Americans, meant that the Allies were eventually strong enough to attack Hitler’s forces in Western Europe. On 6 June 1944, allied forces landed in Normandy (this event is often referred to as ‘D-Day’). Following victory on the beaches of Normandy, the allied forces pressed on through France and eventually into Germany. The Allies comprehensively defeated Germany in May 1945. The war against Japan ended in August 1945 when the United States dropped its newly developed atom bombs on the Japanese cities of Hiroshima and Nagasaki. Scientists led by Ernest Rutherford, working at Manchester and then Cambridge University, were the first to ‘split the atom’ and took part in the Manhattan Project in the United States, which developed the atomic bomb. The war was finally over. Born in Scotland, Fleming moved to London as a teenager and later qualified as a doctor. He was researching influenza (the ‘flu’) in 1928 when he discovered penicillin. This was then further developed into a usable drug by the scientists Howard Florey and Ernst Chain. By the 1940s it was in mass production. Fleming won the Nobel Prize in Medicine in 1945. Penicillin is still used to treat bacterial infections today. Although the UK had won the war, the country was exhausted economically and the people wanted change. During the war, there had been significant reforms to the educational system and people now looked for wider social reforms. In 1945 the British people elected a Labour government. The new Prime Minister was Clement Attlee, who promised to introduce the welfare state outlined in the Beveridge Report. In 1948, Aneurin (Nye) Bevan, the Minister for Health, led the establishment of the National Health Service (NHS), which guaranteed a minimum standard of health care for all, free at the point of use. A national system of benefits was also introduced to provide ‘social security’, so that the population would be protected from the ‘cradle to the grave’. The government took into public ownership (nationalised) the railways, coal mines and gas, water and electricity supplies. The UK developed its own atomic bomb and joined the new North Atlantic Treaty Organization (NATO), an alliance of nations set up to resist the perceived threat of invasion by the Soviet Union and it allies. Britain had a Conservative government from 1951 to 1964. The 1950s were a period of economic recovery after the war and increasing prosperity for working people. The Prime Minister of the day, Harold Macmillan, was famous for his ‘wind of change’ speech about decolonisation and independence for the countries of the Empire. Clement Attlee was born in London in 1883. His father was a solicitor and, after studying at Oxford University, Attlee became a barrister. He gave this up to do social work in East London and eventually became a Labour MP. He was Winston Churchill’s Deputy Prime Minister in the wartime coalition government and became Prime Minister after the Labour Party won the 1945 election. He was Prime Minister from 1945 to 1951 and led the Labour Party for 20 years. Attlee’s government undertook the nationalisation of major industries (like coal and steel), created the National Health Service and implemented many of Beveridge’s plans for a stronger welfare state. Attlee also introduced measures to improve the conditions of workers. William Beveridge (later Lord Beveridge) was a British economist and reformer. He served briefly as a Liberal MP and was subsequently the leader of the Liberals in the House of Lords but is best known for the 1942 report Social Insurance and Allied Services (known as the Beveridge Report). The report was commissioned by the wartime government in 1941. It recommended that the government should find ways of fighting the five ‘Giant Evils’ of Want, Disease, Ignorance, Squalor and Idleness and provided the basis of the modern welfare state. Richard Austen Butler (later Lord Butler) was born in 1902. He became a Conservative MP in 1923 and held several positions before becoming responsible for education in 1941. In this role, he oversaw the introduction of the Education Act 1944 (often called ‘The Butler Act’), which introduced free secondary education in England and Wales. The education system has changed significantly since the Act was introduced, but the division between primary and secondary schools that it enforced still remains in most areas of Britain. The decade of the 1960s was a period of significant social change. It was known as the ‘swinging sixties’. There was growth in British fashion, cinema and popular music. Two well-known pop music groups at the time were The Beatles and The Rolling Stones. People started to become better off and many bought cars and other consumer goods. The 1960s was also a time of technological progress. Britain and France developed the world’s only supersonic commercial airliner, Concorde. New styles of architecture, including high-rise buildings and the use of concrete and steel, became common. Sir Christopher Cockrell (1910-99), a British inventor, invented the hovercraft in the the 1950s. Britain and France developed Concorde, the world’s only supersonic passenger aircraft. It first flew in 1969 and began carrying passengers in 1976. Concorde was retired from service in 2003. In the 1960s, James Goodfellow (1937-) invented the cash-dispensing ATM (automatic teller machine) or ‘cashpoint’. The first of these was put into use by Barclays Bank in Enfield, north London in 1967. IVF (in-vitro fertilisation) therapy for the treatment of infertility was pioneered in Britain by physiologist Sir Robert Edwards (1925-) and gynaecologist Patrick Steptoe (1913-88). The world’s first ‘test-tube baby’ was born in Oldham, Lancashire in 1978. In 1996, two British scientists, Sir Ian Wilmot (1944-) and Keith Campbell (1954-2012), led a team which was the first to succeed in cloning a mammal, Dolly the sheep. This has led to further research into the possible use of cloning to preserve endangered species and for medical purposes. Sir Peter Mansfield (1933-), a British scientist, is the co-inventor of the MRI (magnetic resonance imaging) scanner. This enables doctors and researchers to obtain exact and non-invasive images of human internal organs and has revolutionised diagnostic medicine. In the late 1970s, the post-war economic boom came to an end. Prices of goods and raw materials began to rise sharply and the exchange rate between the pound and other currencies was unstable. This caused problems with the ‘balance of payments’: imports of goods were valued at more than the price paid for exports. The 1970s were also a time of serious unrest in Northern Ireland. In 1972, the Northern Ireland Parliament was suspended and Northern Ireland was directly ruled by the UK government. Some 3,000 people lost their lives in the decades after 1969 in the violence of Northern Ireland. Born in Manchester, Mary Peters moved to Northern Ireland as a child. She was a talented athlete who won an Olympic gold medal in the pentathlon in 1972. After this, she raised money for local athletics and became the team manager for the women’s British Olympic team. She continues to promote sport and tourism in Northern Ireland and was made a Dame of the British Empire in 2000 in recognition of her work. Margaret Thatcher, Britain’s first woman Prime Minister, led the Conservative government from 1979 to 1990. The government made structural changes to the economy through the privatisation of nationalised industries and imposed legal controls on trade union powers. Deregulation saw a great increase in the role of the City of London as an international centre for investments, insurance and other financial services. Traditional industries, such as shipbuilding and coal mining, declined. In 1982, Argentina invaded the Falkland Islands, a British overseas territory in the South Atlantic. A naval taskforce was sent from the UK and military action led to the recovery of the islands. John Major was Prime Minister after Mrs Thatcher, and helped establish the Northern Ireland peace process. Margaret Thatcher was the daughter of a grocer from Grantham in Lincolnshire. She trained as a chemist and lawyer. She was elected as a Conservative MP in 1959 and became a cabinet minister in 1970 as the Secretary of State for Education and Science. In 1975 she was elected as Leader of the Conservative Party and so became Leader of the Opposition. Margaret Thatcher was the first female Prime Minister of the UK. Following the Conservative victory in the General Election in 1979, Margaret Thatcher became the first woman Prime Minister of the UK. She was the longest-serving Prime Minister of the 20th century, remaining in office until 1990. During her premiership, there were a number of important economic reforms within the UK. She worked closely with the United States President, Ronald Reagan, and was one of the first Western leaders to recognise and welcome the changes in the leadership of the Soviet Union which eventually led to the end of the Cold War. Roald Dahl was born in Wales to Norwegian parents. He served in the Royal Air Force during the Second World War. It was during the 1940s that he began to publish books and short stories. He is most well known for his children’s books, although he also wrote for adults. His best-known works include Charlie and the Chocolate Factory and George’s Marvellous Medicine. Several of his books have been made into films. In 1997 the Labour Party led by Tony Blair was elected. The Blair government introduced a Scottish Parliament and a Welsh Assembly (see page 129). The Scottish Parliament has substantial powers to legislate. The Welsh Assembly was given fewer legislative powers but considerable control over public services. In Northern Ireland, the Blair government was able to build on the Peace process, resulting in the Good Friday Agreement signed in 1998. The Northern Ireland Assembly was elected in 1999 but suspended in 2002. It was not reinstated until 2007. Most paramilitary groups in Northern Ireland have decommissioned their arms and are inactive. Gordon Brown took over as Prime Minister in 2007. Throughout the 1990s, Britain played a leading role in coalition forces involved in the liberation of Kuwait, following the Iraqi invasion in 1990, and the conflict in the former Republic of Yugoslavia. Since 2000, British armed forces have been engaged in the global fight against international terrorism and against the proliferation of weapons of mass destruction, including operations in Afghanistan and Iraq. British combat troops left Iraq in 2009. The UK now operates in Afghanistan as part of the United Nations (UN) mandated 50-nation International Security Assistance Force (ISAF) coalition and at the invitation of the Afghan government. ISAF is working to ensure that Afghan territory can never again be used as a safe haven for international terrorism, where groups such as Al Qa’ida could plan attacks on the international community. As part of this, ISAF is building up the Afghan of this, ISAF is building up the Afghan National Security Forces and is helping to create a secure environment in which governance and development can be extended. International forces are gradually handing over responsibility for security to the Afghans, who will have full security responsibility in all provinces by the end of 2014.